Scotty Mitchell died on Wednesday. Tennis players in Salisbury (a.k.a. great friends) will miss him mightily. As a player, he had an amazing forehand crosscourt return of serve. The angle was so sharp it made one wonder how the ball could realistically get over the net. In my 20’s and 30’s, I played a lot of doubles matches against Scotty. In the traditional manner of the day, I served and volleyed, every time. Always serve and volley. Always. Being a teaching pro and a tournament player, 35 years younger than Scotty, I used to look at the old man and assume I could overpower him. So I would serve, come in, and then watch these effortless returns scoot by me, WAY out of my reach — almost sideways to the net. Amazing. But of course it was the conversation that set him apart the most. I only saw him at three places. Primarily at the tennis courts. But also in coffee shops and at the library. Scotty was a constant reader, always sharing something fascinating from the book he was currently in. He was kind of a reluctant scholar — an extremely well educated man with tons of life experience who could relate to absolutely anybody. A lot of characters show up at the tennis courts (especially back in the day, when pick-up games were the norm in tennis in Salisbury). Oftentimes, one shows one’s true colors in a close match. Scotty was great with everybody. I remember a pick-up match in which an argument erupted over a line call. Two of the guys started getting nasty. One of them (seriously, now) pulled a knife out of his tennis shorts and flicked out the blade. I was watching. Scotty was on the court, playing. He wasn’t rattled in the least. If my memory serves me correctly, he was 55 when he moved to Salisbury. That was in the City Park tennis era and the sport of tennis was riding a wave of popularity. The courts were full much of the time. You didn’t need to make phone calls. I would just ride my bike down there and find a game. It was quite a family. He retired from G.E. about the time Catawba built it’s new tennis center (about 28 years ago?). He became the tennis coach there. It was a labor of love. I know, because I applied for the job myself and didn’t get it — possibly because my jaw dropped when they told me the pay. I live two blocks from those courts and in those years made my way there daily. Scotty was the maitre ‘d. My son grew up playing there and being the recipient of Scotty’s warm encouragement. I loved hitting with Aaron, but he preferred playing with Scotty. During much of his childhood and teen years, he would ride his bike to the courts almost every day and hit balls or play sets with Scotty. The man was in his late 70’s and early 80’s then, and he was a magnet for tennis players. We couldn’t afford for Aaron, my son, to take a lot of lessons. I taught him the fundamentals myself. But it was Scotty’s incredible generosity that was largely responsible for Aaron having a tennis scholarship in college. Many days, I would hang out at the courts and talk Scotty’s ear off while he strung rackets, listened to my various woes, and shared his wisdom. A Dartmouth grad. A WWII soldier in the Pacific. An avid reader. A father of six. He said he played tennis as a child and then turned to golf until he was in his 50’s and moved to Salisbury. Then it was all tennis. He, Dr. David Smith, Dr. Joe Corpening, and my father were all about the same age. Scotty was the oldest, I think — by a year. He died Wednesday at the age of 92, outliving the other three. They were all remarkable people and tougher than nails, accomplished tennis players who kept running and hitting balls until their bodies would no longer allow them to. I regret that I can’t be at the funeral tomorrow and be a part of the sharing of memories. I last saw him a couple of months ago, at the City Park. He was sitting on the bench, watching a doubles match. He asked me about my life, my work, my family. I asked him if was going to join the game — if he was still playing. Scotty was witty, funny, kind, and wise. He was unique. But these memories of him are not unique. I know I speak for countless others when I say I loved him, I’ll miss him, and I’m extremely grateful to have spent time with him in this life. Thanks for bringing back such wonderful memories of Salisbury tennis. I remember Scotty well, still hoping to play as well as him some day. Salisbury will miss him. He was a good friend, great player and wonderful human. This was also during my active tennis playing days. Everything, I believe, Sammy wrote was true. I wasn’t there for the knife incident however. Everyone just showed up to play most every day and night.. always somebody to play with. Scotty was a fine tennis player and gentleman. 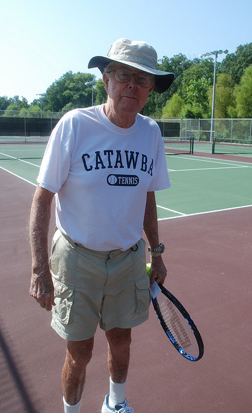 Will sure miss him being around the courts at City Park and Catawba College. Shane. thanks for sharing this article with all of us who played together then.